PTFE coated conveyor belts are often the belt of choice for machine manufacturers of fusing, laminating or powder coating lines due to the excellent extreme temperature resistance and non-stick properties the material offers. Flatbed laminator systems are double belt presses with both in line heating and cooling sections. The materials that are laminated are often covered with a heat activated adhesive therefore the PTFE belt is an excellent choice due to its non stick properties. Also due to the high and low temperatures experienced immediately after each other within the process, the belts are well suited to handle this quick change in temperature. 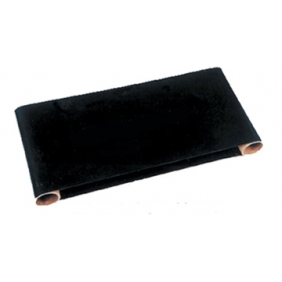 The belts are usually supplied in antistatic black and are available in a number of thicknesses. PTFE glass cloth is usually offered in 0.37mm thick. The joint is a smooth scarfed overlap type to prevent marking of the products. - available in all practicable size,not the custom made belsts,shipping fast. Overlap Belt Joint: Overlap joints are a simple and easy joint to use where having an even surface is not critical.This is the most popular seam because it is strong inexpensive and easiest to produce. The disadvantage of the overlap seam is that it is not very smooth and in some applications the seam may mark the material being fused. In addition, because the overlap seam is more than double the thickness of the rest of the belt it is slightly stiffer and suffers from early flex fatigue and very often breaks. Scarfed Belt Joint:A scarf joint is similar the overlap but offer a smooth transition for the product to run offering no lip for products to catch on.This is the smoothest, strongest, most flexible seam available today. It resembles a 30 mm overlap seam but is much smoother and more flexible. There is no almost double thickness, as the mating surfaces are carefully ground to a taper and securely welded. Tell us what you think about Fusing Belts, share your opinion with other people. Please make sure that your review focus on Fusing Belts. All the reviews are moderated and will be reviewed within two business days. Inappropriate reviews will not be posted.